It’s the Red Sox season opener, and the official start of their title defense, as they take on the Seattle Mariners Thursday night. And while playoff baseball is several months away, it’s never too early for Red Sox Nation to talk about another World Series title, even if the odds are against a repeat. The final out in Game 5 of the World Series. The champagne- and beer-fueled celebration in the visitors’ clubhouse at Dodger Stadium. The duck boat parade. They’re all vivid, but distant memories now. But not too distant. The Red Sox' success in 2018 fuels talk of another World Series championship in 2019. Throughout spring training, questions about a repeat were asked in interview after interview. And the answers from players focused on how tough it is to win back-to-back titles. Pitcher Matt Barnes adds: “It’s hard to win one, let alone two. You’ve got to have a good team. A lot of stuff has got to go your way and you’ve got to play consistently good baseball for seven months of the year.” When the Red Sox play the Seattle Mariners at T-Mobile Park Thursday, it’s the season opener for Martinez, Barnes and company, and the official start of their title defense. And the odds are against a repeat. The Red Sox will face tough competition in the American League from the New York Yankees and the Houston Astros. Plus, most teams will view a series versus the Red Sox as an important test. They’ll see it as an opportunity to prove themselves, especially in early-season match-ups. Of course, the Red Sox want to stay on top. But to do that, not only will they need to beat the Yankees, Astros and other AL title contenders, they’ll have to take on some daunting baseball history. It’s been almost 20 years since a team won back-to-back titles in baseball. In 2000, the Yankees finished a dynastic run with their third World Series win in a row. For comparison, the last NBA team to repeat was the Golden State Warriors. And they did it last year. The last NHL team? The Pittsburgh Penguins the year before that. NFL team? New England fans probably remember when the Patriots did it in 2005. What makes it tougher to repeat in Major League Baseball? “In baseball, the best team does not always win,” says Boston Globe columnist Dan Shaughnessy. “The hot team wins, and there [are] so many teams, the odds are against everybody." One big reason for baseball being tough on favorites? The regular season grind. The MLB season is excruciatingly long — 162 games spread over six months. And it wears down players. The team that’s hot in June or July might be struggling and injury-riddled by September. Add in playoff baseball and teams that compete in the World Series play a month longer than anybody else. That’s a month of high-intensity, high-stress baseball. For pitchers, that could mean throwing an extra 20 to 25 innings with an already-taxed arm. They may get a World Series ring. But they also get an offseason that’s a month shorter. The good news: Red Sox manager Alex Cora thinks a lot about getting his players rest throughout the regular season. He did it last season when the Red Sox set a franchise record with 108 wins, and he’s looking at this season’s schedule with rest in mind. Another reason for guarded optimism when it comes to a Red Sox repeat? The team returns 20 of the 25 players on its World Series roster. With that number comes established team chemistry and valuable experience. The only potential downside: The Red Sox will keep getting asked a lot about last year. Mookie Betts, the reigning AL MVP. 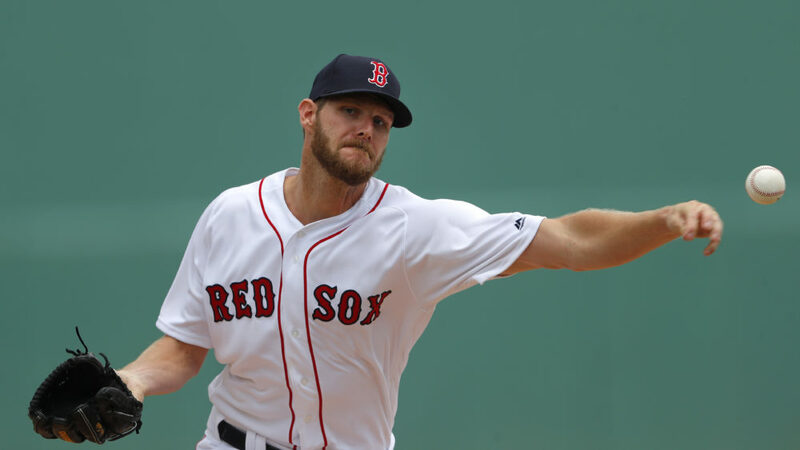 Boston Red Sox pitcher Chris Sale is set to start Opening Day against the Mariners in Seattle on Thursday.